Without a doubt one of my top two favorite things in the world to do is spend an evening with family or friends or both cooking a wonderful meal. Two weeks ago my niece, Madi was on Christmas break from her first semester in college and I was beyond honored that she wanted to spend her very last evening home cooking a dinner with her mom and me. So what was Madi’s last dinner request? 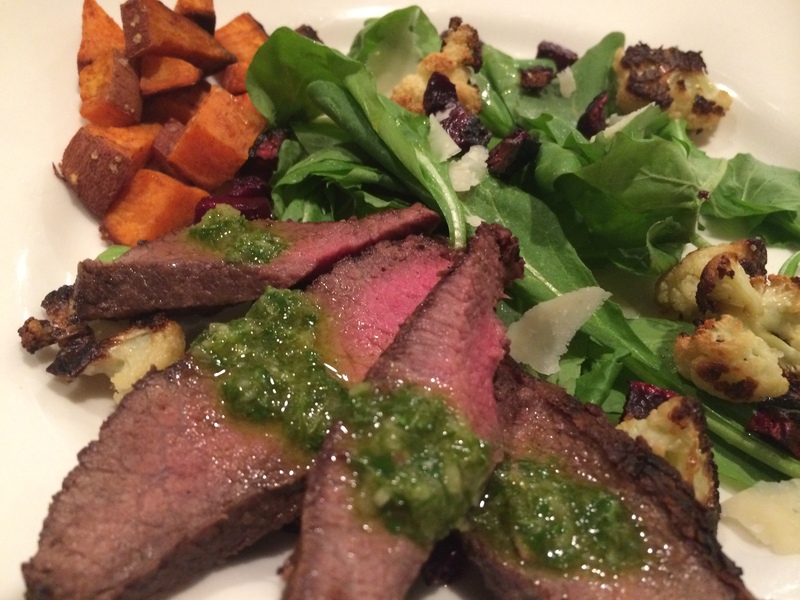 Chimichurri steak over arugula with roasted sweet potatoes. My sister Shan and I got to work on the chimichurri while Madi replicated her good friend Bryce’s sweet potato recipe. I have to admit I had my own idea of what I wanted my roasted sweet potatoes to taste like going in. Thyme, olive oil, salt… roasted. But Madi was raving about Bryce’s version and now I know why. They are insanely good. Sort of savory… kind of desserty. Coconut, cinnamon and salt… oh.em.gee. I don’t know how to describe just how good they are, but I can tell you how to make them… and they are super easy!